This is a picture of one of the first commercial trials we ever did. The soil as can be seen is a sandy ash, which is very low fertility. When we started the plants were smaller and suffering from nutrient deficiency and a leaf miner attack. The lower leaves show this. It was early spring when we started , around October and this picture was taken around January, which is mid summer and hot and dry, especially on these soils. There were two applications of Pest Protection on this plant. 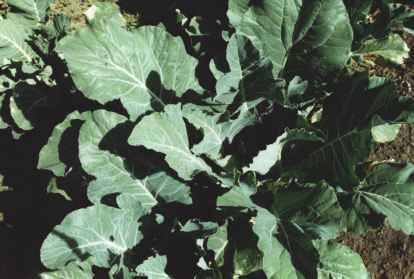 It can be seen that after the first the leaf green deepened and the deficiency and insect attack stopped. After the second spray application the plant colour deepened again. The significant things with these pictures are that there are no caterpillar damage and no mineral dificiencies even when grown in a hot summer on poor soil. The heading of these plants were controlled by the spraying of 501 compound. Pest protection tends to keep plants in leaf, once the plants were big enough the 501 comp. bought them to head. 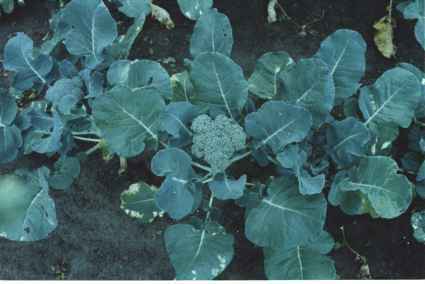 This is a cauliflower from the same period, not the absence of any pest attack. The size of this plant is easily 1 metre across. The picture does not show its true size. Again heading was controlled by 501. 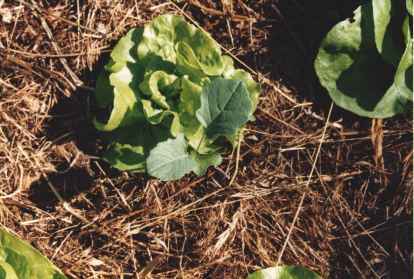 This is a picture of lettuce and brocolli growing in the middle of winter on wet slimey clay. There was a water overflow pipe just above them and water literally washed over this garden. Note there is no slug damage on either of these plants. These plants went on to full maturity without damage.